Did I say bad? No, I meant it's bad... as in good. 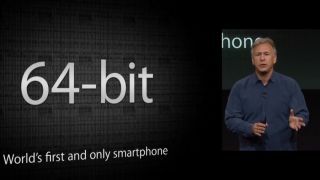 Qualcomm looks as if it's calming its chief marketing officer, who dismissively called Apple's 64-bit iPhone 5S processor a gimmick in a recent interview. "I think they are doing a marketing gimmick," said Anand Chandrasekher last week. "There's zero benefit a consumer gets from that." Maybe not zero benefit now. The San Diego-based chipmaker issued a statement, backtracking from Chandrasekher's harsh criticism. "The comments made by Anand Chandrasekher, Qualcomm CMO, about 64-bit computing were inaccurate, a Qualcomm spokesperson told TechRadar. Qualcomm's newfound stance on 64-bit mobile processors could indicate that it is likely going down the same path, as evidenced by its additional remarks today. "The mobile hardware and software ecosystem is already moving in the direction of 64-bit," told us in a statement. "The evolution to 64-bit brings desktop class capabilities and user experiences to mobile, as well as enabling mobile processors and software to run new classes of computing devices." Likewise, the semiconductor company probably doesn't want to become an enemy of Apple right now. After all, the iPhone maker is looking for ways to ditch Samsung, which still manufacturers its A7 processor. At least Qualcomm fessed up to Chandrasekher's comments being "inaccurate" instead of trying to explain them away by saying 64-bit isn't a "gimmick," but something it wants to "mimic." This, from the company that wants to give you the 'digital sixth sense'?